The student budget below is an estimate of living expenses associated with being a full-time graduate student at Wake Forest. At Wake Forest, Graduate Business students live off campus. There are many housing options close to campus and many provide free shuttle bus service. These estimated expenses below include: books, housing, food, utilities, renter’s insurance, transportation and personal expenses such as cell phone, cable/internet, laundry/dry cleaning, clothing, hair/grooming and recreation. This budget does not consider existing consumer debt. Minor adjustments may be necessary to fit your individual circumstances. 1. Living expense estimates are based on reasonable cost of living for the Winston-Salem area. A student’s total financial aid package (scholarships, fellowships, and all education loans) cannot total more than the estimated living expenses plus tuition and fees. Winston-Salem, NC offers a great quality of life along with a low overall cost of living and very affordable housing options. 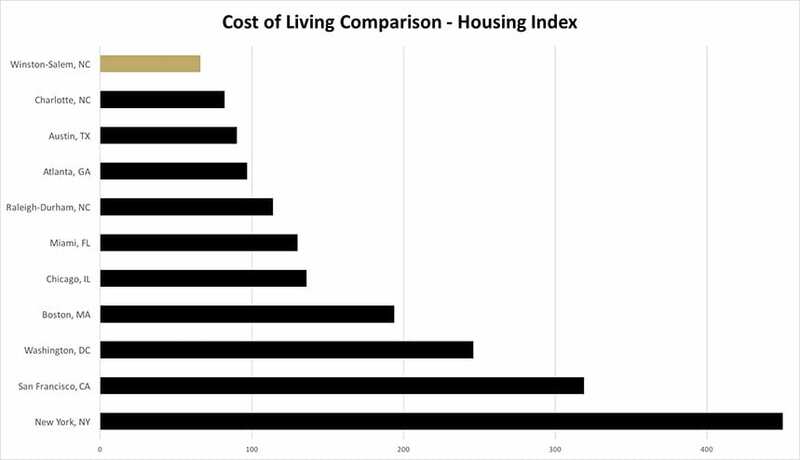 The chart below compares Winston-Salem to other cities across the U.S. in terms of housing expenses and composite cost of living. If you have specific questions, please contact Linda Higgins, Associate Director of Financial Aid, at 336.758.4424, or Michelle Van Meter, Assistant Director of Financial Aid, at 336.758.4045, or email the Financial Aid Office at sbfinaid@wfu.edu.